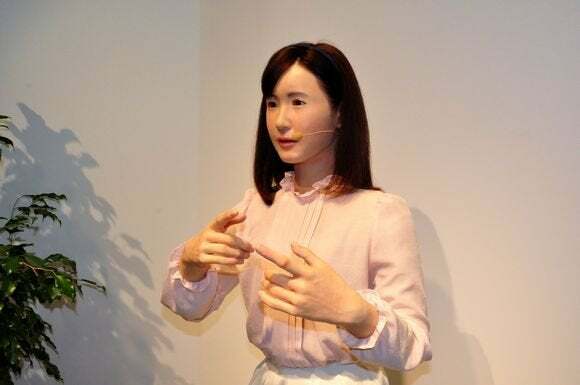 Its hands are a tad too rubbery and you won’t mistake it for a human, but an android from Toshiba can effectively mimic a sign language interpreter. Shown off at the Ceatec 2014 tech fair outside Tokyo, the lifelike humanoid robot can do Japanese sign language while lip synching to a recorded message. The robot, which goes by the name Aiko Chihira, looks like a woman dressed in a pink blouse and white skirt. It was seated behind a desk and signing the words to a self-introduction heard over a speaker system. The android was only performing sign language for its own prerecorded statements. Like other lifelike androids developed in Japan, it’s powered by an air-servo system and an air compressor. The technology allows for smooth arm and hand gestures. Aiko has 43 actuators, including 15 in its head for rich facial expression, according to Toshiba, which developed the machine along with Tokyo engineering company Alab and a number of Japanese universities. The machine can currently do Japanese sign language, and will be programmed to perform American sign language (ASL) in the future. The latter is more challenging, Tokuda said, because it requires the signer to use an alphabet. An ASL version could be exhibited at CES in January, he said, adding that camera systems and other sensors could be included in the system to enhance its sign language abilities. Toshiba said it hopes to deploy Aiko as a receptionist robot at exhibitions next year. Lifelike androids have been shown off at exhibitions in Japan for more than a decade, but they have yet to find commercial applications. Hiroshi Ishiguro, a roboticist at Osaka University and Advanced Telecommunications Research Institute International, recently introduced female robots called Otonaroid and Kodomoroid as the new “staff members” of a Tokyo technology museum. None of the machines would pass a Turing Test , a measure of whether artificial intelligence can pass for a human, but Japanese developers still think that human-like robots will find useful social roles such as communication tools and household companions.